Spring is in the air so make your own modern floral wreath to match the season inside or outside of your home. with a few materials and easy steps, your house can be spring ready in no time with a gorgeous wreath that simply states, hello spring! 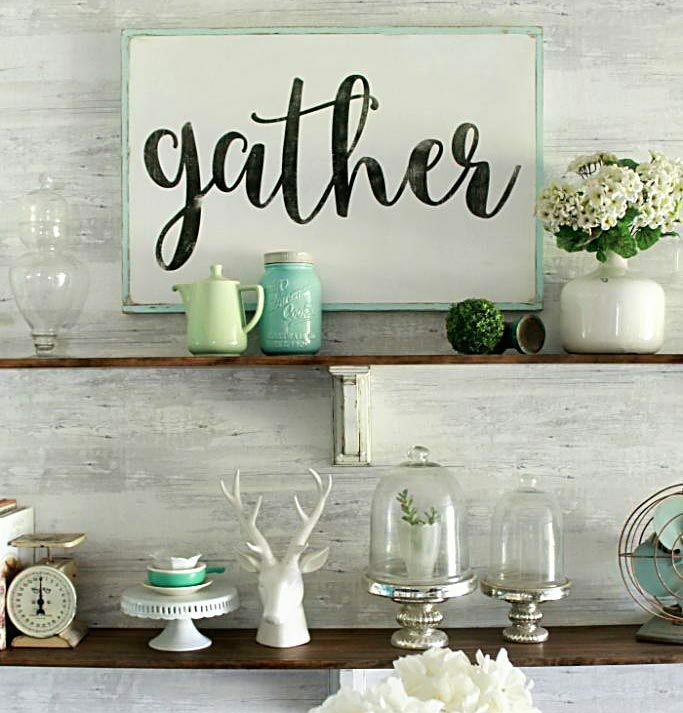 Be sure to scroll to the end of the post to see 27 other DIY Spring Wreaths! To get started you’ll need a mostly-done for you wreath, compliments of your local hobby store. Ours was found in Joann and yes, we used our 40% off coupon! Broken down: this could be a metal ring (or embroidery hoop) that already has greenery attached to it, pictured below. You can always snag a metal ring in the sewing section and glue some greenery from the floral department on as well but as-is, this one was priced below what it would have cost us more to make it by hand. 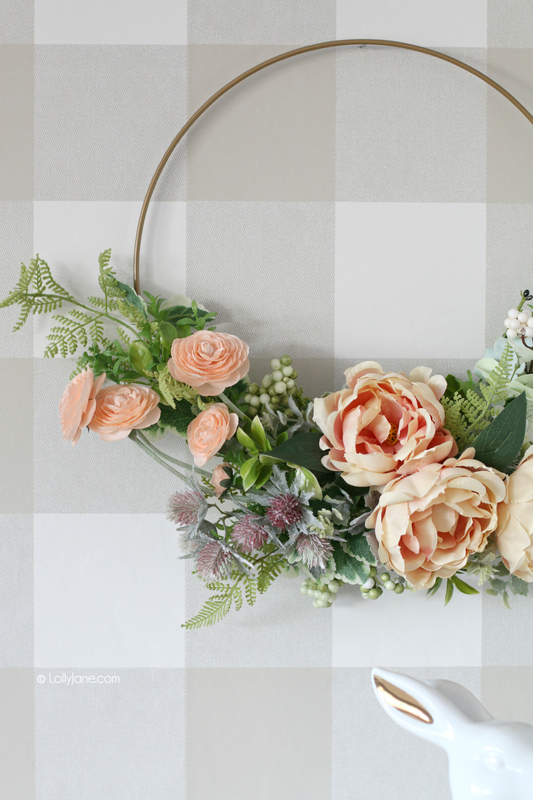 Simply tuck a variety of floral picks on top of greenery, secure with hot glue or floral wire. Keep tucking away until the flowers are over the floral picks and/or greenery then secure with hot glue or floral wire. 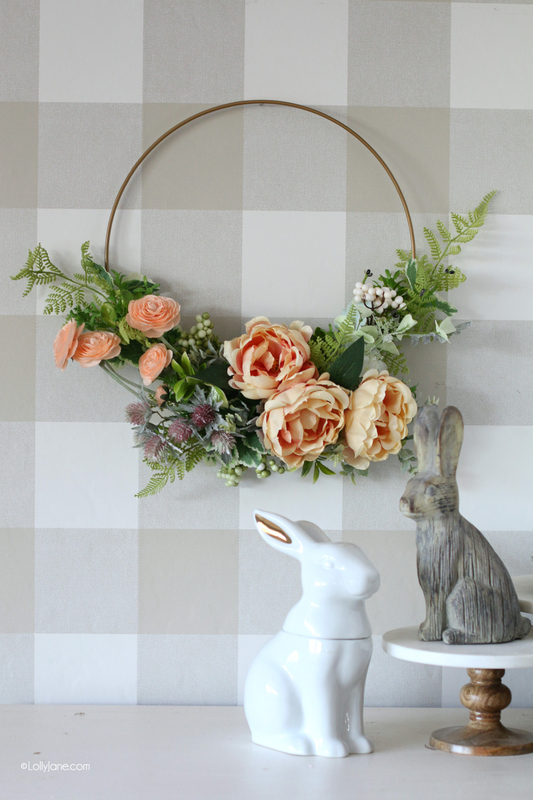 Hanging a modern floral wreath is really easy… you can simply hang it from a nail or tack in the wall as it is very lightweight or, if you want to be fancy, tie a ribbon to the top of the hoop and hang from said nail or tack in the wall. Of course it is absolutely darling on your front door to greet guests and really screams, Welcome spring! I’m loving the hoop wreaths…thanks for the inspiration! We’re still facing cold temps, but with all the sunshine we’ve been having, I thinking spring. 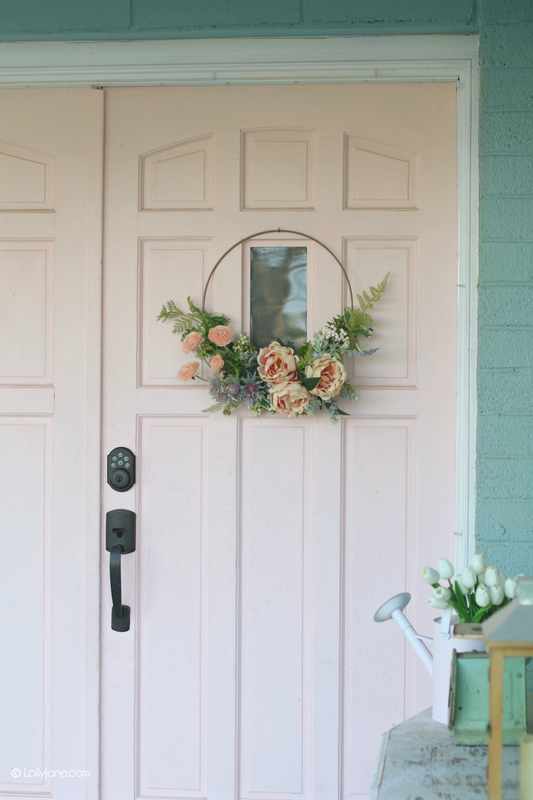 I love modern wreaths, especially when they’re hung on gorgeous pink doors…all the little heart eyes. Oh my, this is so beautiful! I’m obsessed with the colors! Stunning!! Love all the soft colors for Spring. Hi Rhonda! Thanks so much! So pretty! I just love the look of modern wreaths. Yours looks SO perfect on your colourful door! Thank you, Jo-Anna! 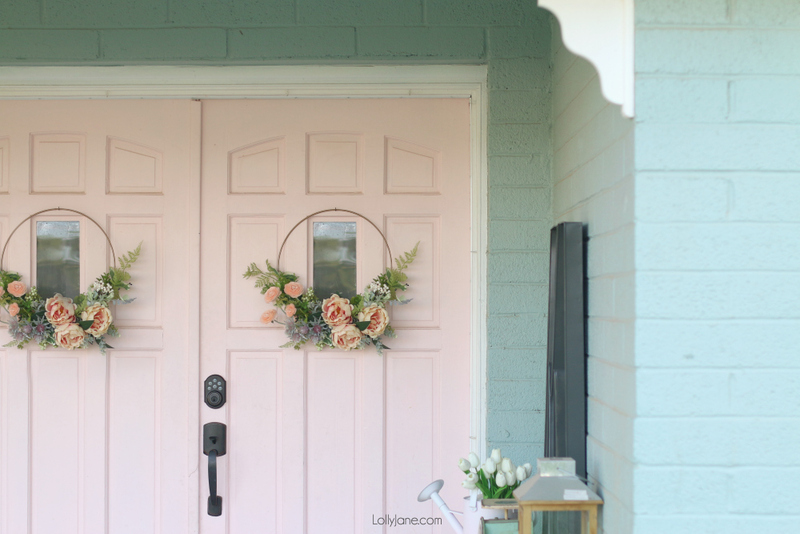 These pink doors have been fun to decorate around! What size is your ring?! I just love this and wanna make it asap!! Bunnies are too fun! Thanks, Christy! Such a pretty wreath and perfect for spring! So pretty! I just love hoop wreaths and yours turned out fabulous! Hey Laura! Thank you so much! Appreciate your sweet comments! Happy Spring! Thank you for sharing your hoop wreath on the blog hop. 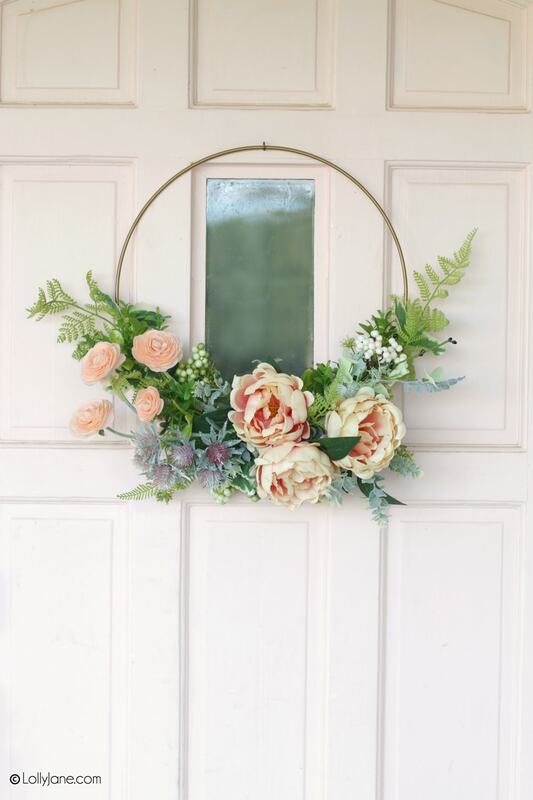 What a pretty hoop wreath, it’s perfect for spring! It’s so fun participating in this series with you! I’ve pinned your wreath to my favorite wreath board to share with others! Stunning! I can’t wait to try and recreate this gorgeous wreath!